position, and from a crashing rider’s spot just under the wheels of his own team car. I’ll admit that my own viewing has been confined to the roadside or the sofa, but I’ve seen a few Tours. Admittedly, this one doesn’t quite offer the dramatic three-way battle and squeaky-bum finish of 1989, nor the crushing displays of dominance seen in ‘93, ’96 or ’98. Even so, of the 30+ grand tours I’ve seen, this year’s event ranks amongst my favourites, and the inability of the leaders to gap each other is the main reason why. It wasn’t just the transitional stages that were livelier than usual this year. The inclusion of the climbs of Mont Des Alouettes and the Mur De Bretagne gave the first week a mini-Classics feel that enlivened the usual procession of sprint wins that dominate the opening week. Don’t get me wrong, I was rooting for Cav all the way, but it was nice to have an opening week in which the first 180km of each stage wasn’t redundant. Of course, Classics are usually ridden by Classics specialists, guys who ride under the assumption that anything you can put your wheel on is part of the course. It takes great bike handling skills to ride a Classic, and not all grand tour riders have them, a fact that may account for the first week’s recurring feature: crashes. Week one of any grand tour is usually punctuated by the sound of splintering carbon and swearing Italians as every rider in the pack is feeling fresh enough to try and occupy the same spot at the head of the field that every other rider is going for. But while we’ve seen Tours that featured more crash retirements, we’ve never seen so many prominent names suffer so badly: Wiggins, Vinokourov, Horner, Brajkovic and Boonen were all gone before we saw a single mountain, and Leipheimer, Gesink, Hoogerland and Kloeden were all inconvenienced by accidents (for inconvenienced, read “thrown arse-first through a barbed wire fence”). Despite the alarming rate of attrition, we still had plenty of big names lined up for a fight. The contenders looked unusually close to each other on paper. Contador, normally the most explosively destructive climber in cycling seemed to have left his legs on the mountainous Giro, where his uphill battles had given him a six minute victory margin. A less explicable uncertainty hung over the Schleck brothers. Neither had looked particularly impressive in the Tour De Suisse, and their wellknown tactical naivete was bound to be a bigger problem now that they’ve left the canny clutches of Bjarne Riis for a vanity team managed by a former PR director, Brian Nygaard. Seriously guys, when the Tour can be won by a deftly passed canapé and some insincere small talk, we’ll call you. If the top contenders were looking less than their best, the second tier were looking unusually strong. Cadel Evans has spent the last two years grafting some formerly absent attacking spirit onto his undoubted talent, and hadn’t broken any bones yet either. Meanwhile, Ivan Basso’s crash disrupted training and poor pre-Tour form looked likely to be compensated for by a strong, savvy team and the possibility that he would ride himself into form just in time for the sort of long, agonising mountain stages that suit his you-are-the-lobsters-I-am-the-boiling-water approach to climbing. Bradley Wiggins, Robert Gesink and Sammy Sanchez had all talked a good fight too, with Wiggo’s Dauphine victory backing up the chat. It was hard to remember a Tour where so many top riders looked so close to each other. Of course, you could argue that Alberto Contador was hampered by that first day crash, but I’d suggest that the missing minute would have meant nothing to an in-form Contador. More importantly, if there is one weakness in Contador (and let us for the love of competitive racing pray fervently that there is) it’s his tendency to poor positioning. Yes, he was caught out behind a crash, just as he was caught out by headwinds in 2009 when HTC Columbia split the field. It was his positioning that scuppered him as much as the crash itself. There was a moment of quivering probabilities atop the Mur De Bretagne, when Alberto Contador attacked, displaying a confidence that made us wonder if he had some legs after all. Like Schroedinger’s cat, there was a moment when Contador’s chances seemed alive and dead simultaneously, but then the probabilities, like his legs, collapsed. Instead, Evans surged to a win so narrow that it set the trend for the rest of the race: the big names just couldn’t put any appreciable time into each other on the hills or mountains. They skirmished ineffectually in the Pyrenees and launched blistering two and three mountain fusillades in the Alps, but to no avail - the gaps never grew to insurmountable proportions. The sight of Evans leading the chasing groups, gritting his teeth and chewing the Schleck and Contador gaps down to non-threatening proportions, made it clear that nine mountain stages were going to be little more than an appetiser for the single time trial, in which Evans defeated the Schleck brothers offhandedly, to secure for himself a hard-earned and utterly deserved Maillot Jaune. 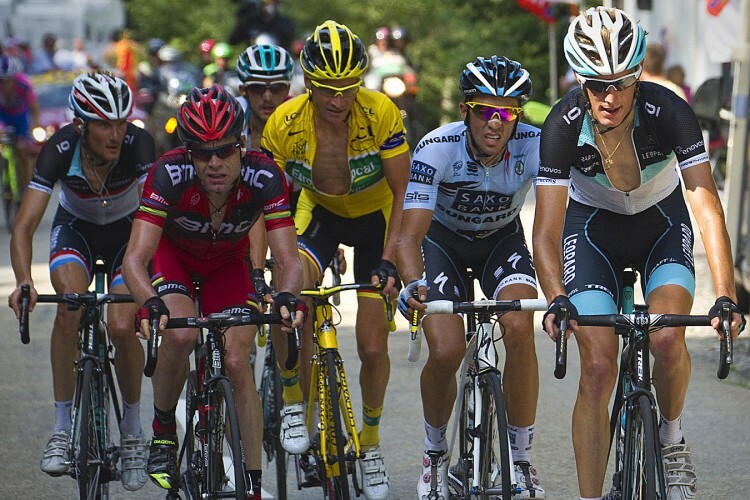 While the mountains weren’t decisive, they were exciting, and not only for Schleck and Contador’s attacks. Seeing Samuel Sanchez take the King of the Mountains jersey with consistent placings in the high mountains (rather than it going to a non-climber capable of aggressive riding over the first week’s speed-bumps) worked wonders to reinvigorate the competition. The Green Jersey competition didn’t really need tweaking, but all the same, I’m glad it was. The added emphasis on stage wins made the jersey feel more valuable than its old first-through-three-villages version, while the number of uphill finishes in the first week brought the hard men like Philip Gilbert into contention alongside the sprinters, which made Mark Cavendish’s eventual victory all the more impressive.